Kepware OPC Alarms and Events Plug-In은 KepServerEX의 OPC DA data를 기반으로 Alarm/Event 발생 조건을 지정하여 DA data 가 이 조건에 이르게 되면 Alarm & Event를 발생시켜 OPC AE Client 에게 정보를 제공하는 옵션이다. 일반 HMI의 Alarm과 달리 OPC AE의 Alarm은 어느 OPC AE Client에서도 Subsciprtion (구독)을 통해 Alarm을 확인할 수 있다. KEPServerEX 설치시 AE Plug-in 옵션을 선택하여 설치할 수 있다. 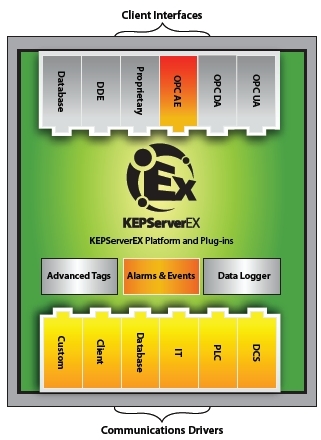 KEPServerEX supports nine OPC AE standard conditions providing flexibility in how Alarms and Events Conditions are calculated and prioritized. Each condition has a unique name and unique set of sub-conditions. The multilevel condition supports multiple sub-conditions. This condition is used if the source has multiple states of interest and there is a need to know the transition between the condition states. For example, if you have a temperature tag with multiple temperatures of interest, use this condition. The HIGH_HIGH sub-condition has the highest priority and the LOW_LOW sub-condition has the lowest. These are single level conditions with a sub-condition that matches the condition name. These conditions are used if a single state of a source is of interest. For example, if you have a temperature tag with a single temperature of interest, use this condition. Note: use HIGH_HIGH for higher priority states and LOW_LOW for lower priority states. The Rate of Change (ROC) condition compares the source data to a static or dynamic ROC. For example, if you have a source tag that represents production output and you want to trigger the condition if the output falls below 100 units a minute, use this condition. Note: use ROC_HIGH for high priority conditions and ROC_LOW for low. The Deviation conditions are used to monitor the deviation of the source data. The condition is triggered if the condition of the source is outside the limits set. The limits can be either a percentage or a static value. For example if you have a source that monitors power consumption and you want to trigger the condition if the power consumption is outside of 100W ±20%, use a deviation condition. sub-condition. This is also commonly called 'priority', especially in relation to process alarms. Values range from 1 to 1000, with 1 being the lowest severity and 1000 being the highest. Typically, a severity of 1 would indicate an event which is informational in nature, while a value of 1000 would indicate a disastrous event. Import and export tag data into a Comma Separated Variable (CSV) file. When using. CSV import and export, tags are created quickly in the desired application. Filter by area, source, event type (simple and conditional), severity, and category. Ability to enable and disable communication areas, sources and conditions through the AE user interface. Create unique alarm input, output and acknowledgement messages. Also create acknowledgment rules for Alarms.